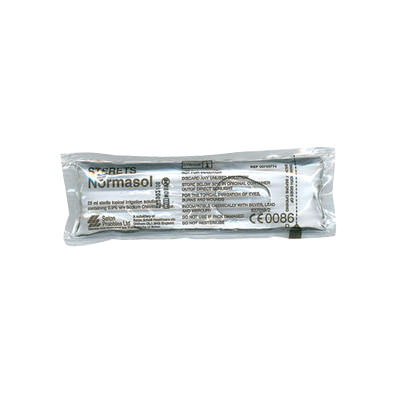 Grow your First Aid kit today and ensure you are ready for every eventuality with the Normasol Sterile Topical Saline 25ml x 25. Each sachet provides a 25ml serving of topical saline solution consisting of salt and water. Suitable for cleaning and washing wounds thoroughly, this safe liquid can also be used to rinse out the mouth and for removing harmful substances and objects from eyes. Provided in handy portions, they can be removed as and when needed to avoid waste and store in a compact manner so as not to overpack any first aid boxes. Designed for all manner of work and medical environments, these topical saline sachets are an essential addition. For the specific care of eyes, we also stock Sterile Eye Wash 500ml alongside our Washproof Plasters Disc Spot and Waterproof Plasters Assorted - keeping you stocked up for any and every work-based accident.